Combining modern technology and innovation with traditional European taste, a contemporary espresso or speciality beverage machine can be the highlight of any breakroom. Lavazza Espresso Point Matinée ensures a consistently superb cup of espresso, thanks to the pre-measured cartridge and extraordinarily user-friendly machines. 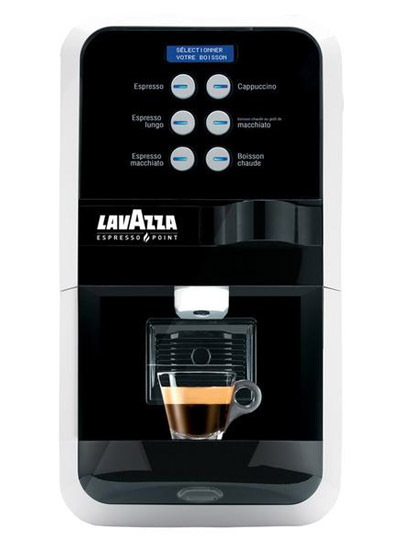 With Lavazza Espresso Point, you can now enjoy the full aroma and taste of cafe-quality espressos and cappuccinos. The Lavazza Espresso Point Matinéeis a single-cup espresso machine that brews using Lavazza's unique cartridge system. It is a semi-automatic machine, very popular in restaurants and food service settings, as well as in some offices. Just like a full-service coffee bar, the Lavazza Espresso Point Matinée also has a built-in steam wand. Use the steam wand to froth milk for cappuccinos and lattes. Clean up is a breeze. The Espresso Point capsules also known as EP capsules once used are ejected into an internal collection drawer. The drawer is large enough to hold about 32 used capsules. The water reservoir holds 102 ounces of water. That is enough water to brew about 27 large drinks (Americano) or 68 small (standard espresso) drinks. AUTOMATIC CARTRIDGE DISPOSAL system into an internal collection drawer that can hold about 32 used capsules. SPACE SAVER at only 9.3" wide and 12.2 deep, it takes less space than many traditional coffee makers. 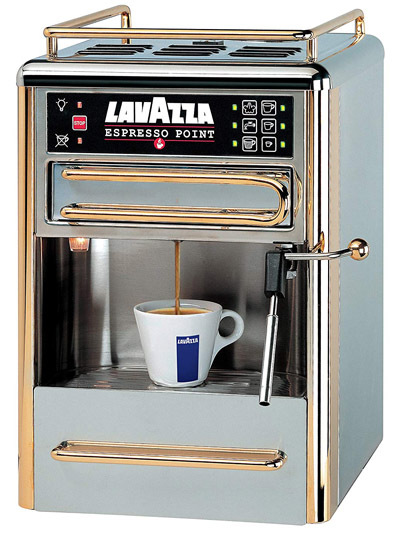 The Lavazza EP 2500 Plus takes the well known and loved single cup Espresso Point to the next level. Not only does it use the unique Lavazza cartridges for an excellent espresso, but also makes creamy milk-based beverages such as cappuccinos and latte macchiatos. This ideal machine for small to medium offices is semi-automatic for a fast, easy beverage with only one touch. For added convenience, used capsules are automatically ejected into an internal bin that holds 20 used cartridges. 6 DRINK OPTIONS Brew espresso, cappuccinos, lungos, latte macchiatos, espresso macchiatos, and other hot drinks with the push of a button. ADJUSTABLE TEMPERATURE Boiler temperature can be adjusted across a range of 7.8° F via the "Delta Temp" setting in 4 increments. AUTOMATIC CARTRIDGE DISPOSAL system into an internal collection drawer that can hold about 20 used capsules. LOW WATER DETECTION A built -in sensor keeps an eye on your water level to alert you when the tank needs refilling. PROGRAMMABLE AUTO OFF feature saves energy when not in use. OPTIONAL CREDIT CARD READER can be used to make drinks purchasable if you so desire. Turn your favorite K-Cup® pod into a cappuccino or latte, or enjoy it on its own. Enjoy a strong, intense coffeehouse experience in under a minute with remarkable ease. INTUITIVE TOUCHSCREEN makes choosing the perfect beverage easy. NO CLEAN UP REQUIRED - automatic used K-Cup® Pod ejection and storage and "quick rinse" feature. 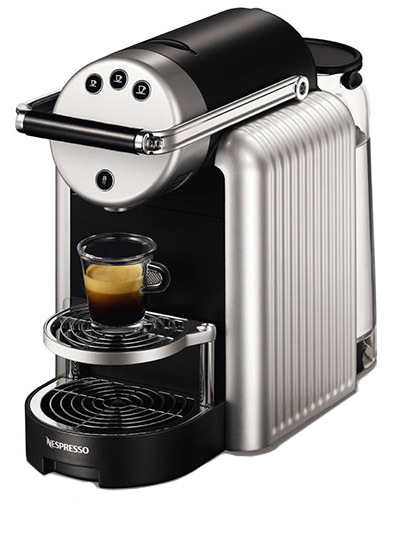 The Zenius from Nespresso is the ultimate high-tech and high-powered option for in-office espresso breaks. There are eight varieties to choose from and three different types of beverage options: Ristretto, Espresso or Lungo. 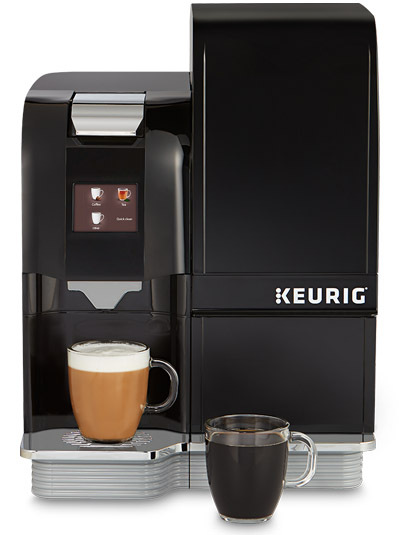 Capsules are provided within the machine, making the brewing process virtually automatic. Just choose a capsule and size and your personal cup of coffee will brew in under 60 seconds. If coffee isn’t your thing, hot water is also provided to produce other hot beverages. Used capsules are automatically deposited into an internal bin to hold them and ensure hands-free clean up for up to 25 cups of coffee. A removable tray allows you to change the size of your mug with ease. BREW SIZE : Ristretto (factory setting 25 ml), Espresso (40 ml), or Lungo (110 ml). SIMPLICITY – Just load your desired pod, push start, and your beverage will be brewed within seconds. FAST HEAT allows the machine to be ready in approxiamately 35 seconds. ENERGY SAVE MODE – the auto power off allows a 0 energy consumption when the machine is not being used. VARIOUS CUP SIZES A swiveling second cup tray accommodates both small espresso cups and tall "American-style" coffee cups. AUTOMATIC CAPSULE DISPOSAL system into an internal collection drawer that can hold about 25 used capsules. 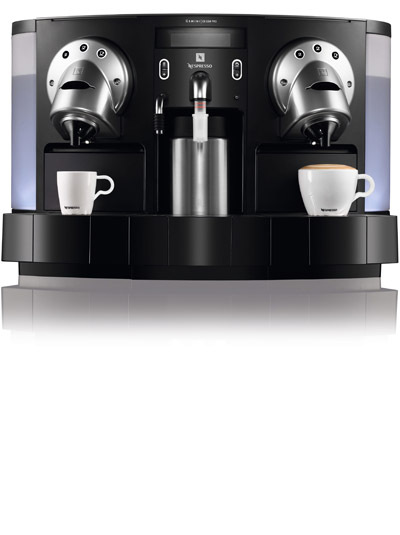 The Gemini from Nespresso is the ultimate high-tech and innovative brewing system perfect for milk-based coffee recipes. The 1-liter thermal container allows for cold milk to be stored for up to 8 hours. Milk is then frothed or steamed in 20 seconds creating the ideal Cappuccino or Latte macchiato every time. This brewing system has a double head extraction system that allows two cups to be prepared simultaneously. Personalize your beverage and choose from 3 different cup sizes, Ristretto, Espresso and Lungo, with a simple press of a button. SPEED INNOVATION – The double extraction head enables the machine to prepare two perfect coffees simultaneously. TRUE COFFEEHOUSE EXPERIENCE Cappuccino, Caffé Latte and Latte Macchiato functions. 1 LITER THERMAL CONTAINER to store fresh, cold milk for up to 8 hours. EASY TO MAINTAIN with disposable milk straws and nozzles. EASE OF USE, NO CLEAN UP Semi-automatic capsule insertion and ejection (internal bin holds 70 used capsules). VERSATILE Separate hot water dispenser widens the variety of beverage choices for everyone.